Haitians Flow Into Canada From The U.S. Amid Renewed Deportation Fears Half of the 14,000 people who crossed into Canada without authorization in the first nine months of 2017 were from Haiti. The end of protected status in the U.S. for Haitians is driving a new surge. A family from Haiti approach a tent in Saint-Bernard-de-Lacolle, Quebec, stationed by Royal Canadian Mounted Police, as they haul their luggage down Roxham Road in Champlain, N.Y., last August. Since last May, thousands of Haitian immigrants have been steadily pouring into Canada, mostly on foot at the Quebec border, in an attempt to flee aggressive anti-immigration policies by the Trump administration. More than 18,000 people filed asylum claims in Canada last year, with up to 250 people per day entering the country at one point last summer. Since then those numbers have dwindled, but the Trump administration's decision to rescind temporary protected status for nearly 60,000 Haitians in November has prompted a new surge of asylum seekers in Canada. Many immigrants were encouraged to come to Canada after Prime Minister Justin Trudeau posted a tweet welcoming refugees in response to President Trump's first travel ban last January, says Marjorie Villefranche, head of Maison d'Haiti, a community center and advocacy organization in Montreal. "I think they took that message as a welcome message," she tells Here & Now's Robin Young. "When you arrive in Canada you have to go through an immigration process anyway, so they knew that it wouldn't be that easy. But I think they are taking a chance because they think probably the mood in Canada is probably better than in the United States." The flow of Haitian migrants into Canada was sparked last summer when the U.S. began considering an end to the temporary residency program for Haitians that has been in effect since the 2010 earthquake. Now that TPS has been terminated, Haitians have until mid-2019 to leave the U.S. Others are entering Canada after traveling through the U.S. from South America, Villefranche says. Mona Hassennia, a director of the nonprofit organization International Social Service, told NPR in an interview last year that 80 percent of her clients have walked over the U.S.-Canada border. "I think the biggest reason that they're coming is the safety issue. They don't feel that there is safety in the United States," she says. Along with Trudeau's open embrace of refugees, many people are also crossing the border because of a legal paradox known as the U.S.-Canada Safe Third Country Agreement. That deal states that if a person applies for refugee status by legally crossing into Canada, they will be deported because the U.S. is considered safe for refugees. But if a person enters illegally, the treaty doesn't apply and they can remain in Canada while their claim for refugee status is decided. 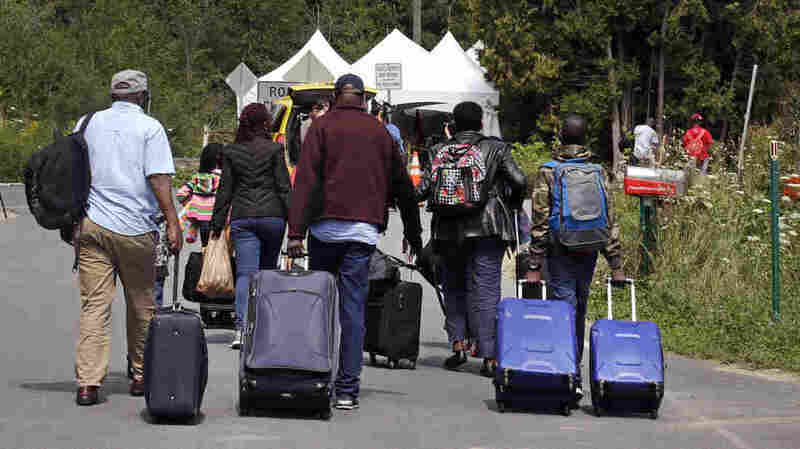 Migrants Choose Arrest In Canada Over Staying In The U.S.
More than 14,000 people entered Canada outside legal border points in the first nine months of 2017, according to the Canadian Broadcasting Corp. Nearly half of those migrants were from Haiti. Villefranche says refugee claimants are permitted to work and receive health care while they wait for their case to be decided, which is a process that can take years. About 10 percent of the 298 Haitian border crossers whose applications were processed last year were granted refugee status, according to Reuters. Almost 6,000 Haitians are still waiting for their claims to be processed in Canada. Many Canadians are calling for an end to the Safe Third Country Agreement, and the government is working to clarify the immigration process. After the U.S. rescinded TPS for nearly 200,000 Salvadorans last week, the Canadian government urged them not to come unless they qualify for refugee status. "Canada has a robust and structured immigration system that must be respected," Canadian politician Pablo Rodriguez told La Presse newspaper in a French-language interview. "Before leaving your job, pulling your child from school and selling your house to come to Canada, make sure you understand the rules and the laws. Because if you don't fill these criteria, chances are you'll be returned, not to the U.S. but to your native country." Many people continue to enter Canada illegally because they know they will not be sent back to the U.S. while their asylum case is considered. "This is a chance. People know that they are taking that chance but better taking that kind of chance instead of being thrown back in Haiti," Villefranche says. "I think this is the calculation that they are making."